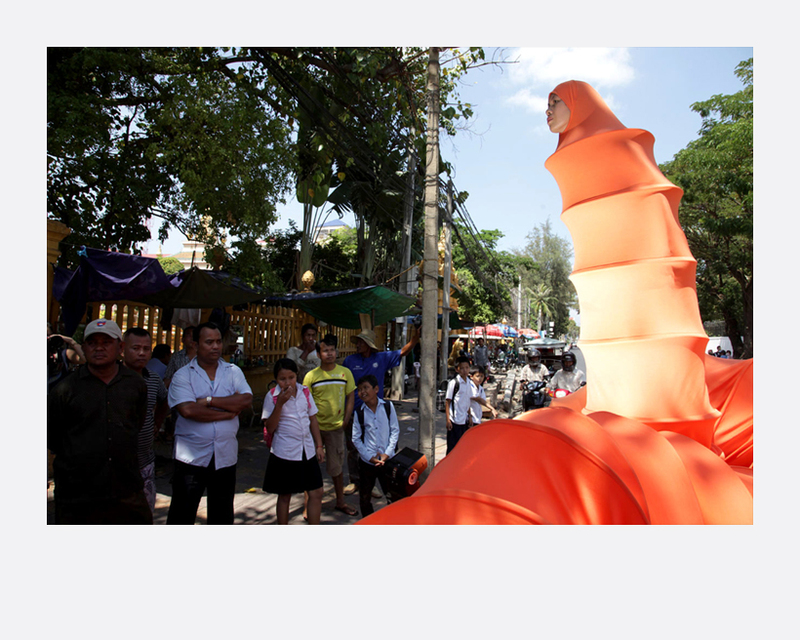 The Buddhist Bug is a fantastical saffron-coloured creature spanning the length of a 30-metre bridge, yet it can easily coil itself into an orange ball of loneliness. Rooted in an autobiographical exploration of identity, the Bug comes from the artist’s own spiritual turmoil between Islam and Buddhism. Set amongst everyday people in ordinary moments, the Bug provokes obvious questions of belonging. It reflects the artist’s personality and love for everyday culture, creating moments that transcend the ordinary. Consistent throughout this series is the unique combination of humour and otherness. 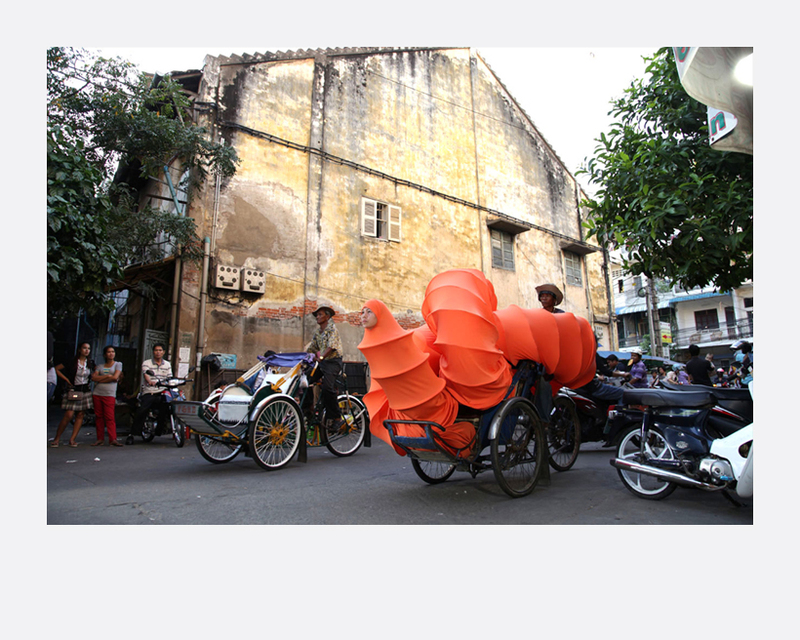 In March 2012, the Bug travelled on a cyclo and remorque to various neighbourhoods in Phnom Penh, Cambodia, its birthplace, with the eventual goal of travelling to other locations relevant to its transnational hybrid identity. The Bug’s ongoing journey is documented in this series of photographic stills and video. 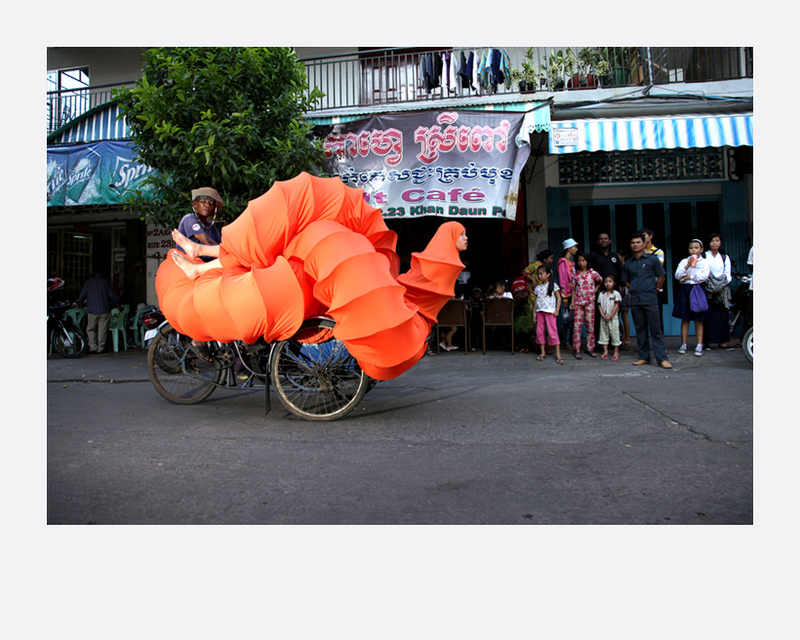 Anida Yoeu Ali (Cambodia, b.1974) is a performance artist, writer, and global agitator. She is a first-genera- tion Muslim Khmer woman born in Cambodia and raised in Chicago. After residing for over three decades outside of Cambodia, Ali returned to work in Phnom Penh as part of her 2011 US Fulbright Fellowship. Utilising an interdisciplinary approach to artmaking, her installation and performance works investigate the artistic, spiritual and political collisions of a hybrid transnational identity. From the Faroe Islands to the Bronx, Copenhagen to Ho Chi Minh City, she lectures, exhibits and performs internationally. of Illinois and an MFA from School of the Art Institute Chicago. Ali is a collaborative partner with Studio Revolt, an independent artist-run collaborative media lab operating out of Phnom Penh where she currently resides.